To get the a project building done in time, construction timeline will give you a good view of all the startups that must be done from the base up to the rooftop of an infrastructure based on the guidelines indicated on it; it’s a scheduling material that any Sample Timelines Templates engineer and architects can look into to complete step by step task per scheduled date of the construction. 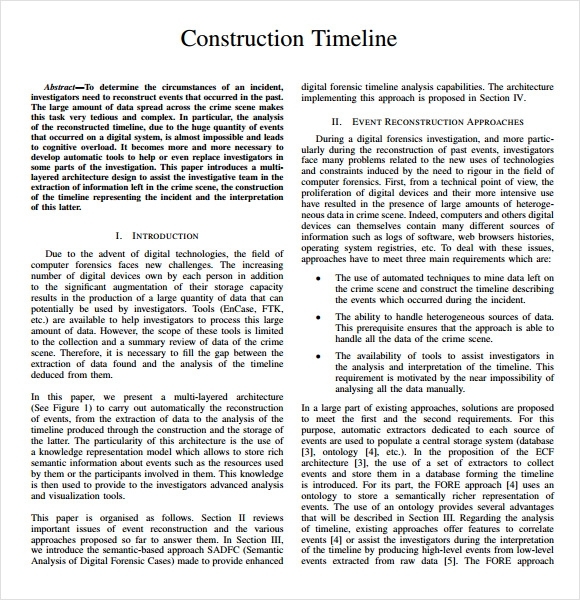 This construction timeline template serves as an example to show how construction projects are divided into phases and various timelines and deadlines are allotted to the particular phases. Here the project is a construction of a new parallel runway. 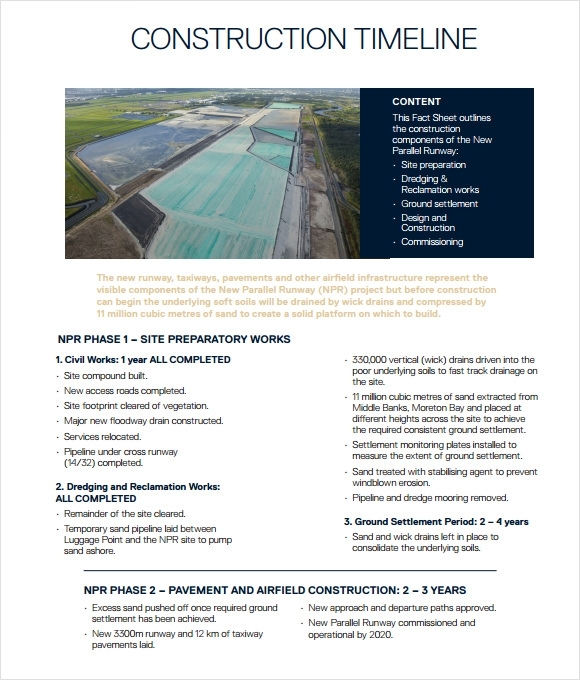 The template shows how Phase 1 of the project, which is site preparation, is almost complete. It is currently in the ground settlement period of 2 – 4 days after which Phase 2, i.e. Pavement and Airfield Construction will start. This free construction timeline shows the exact dates for the construction of 3 libraries, namely Central Library, Clemmons, Kernersville. It shows an elaborately detailed timeline with activities scheduled and planned from the month of November in 2011 to September 2020. The activities related to construction are public meetings, selection of consultant and plant and site recommendation, bidding, contractor selection, land purchase and construction, in this very order. This construction timeline template dated march 2016, serves as a sample to show what an official projected construction timeline report looks like. 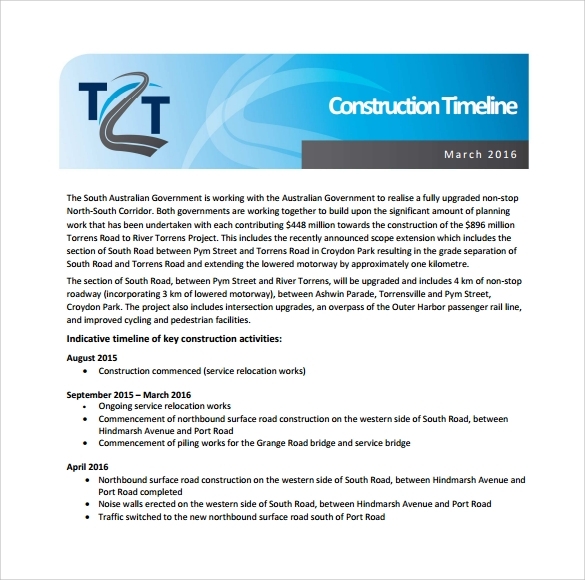 In this template, the South Australian government is said to have collaborated with the Australian government to bring into existence a fully upgraded North – South corridor. According to the indicative timeline of key construction activities, Construction was scheduled to commence on august 2015 in the form of service relocation work. Construction is scheduled to be completed on April 2016 and the traffic shall then be switched to newly northbound surface road. 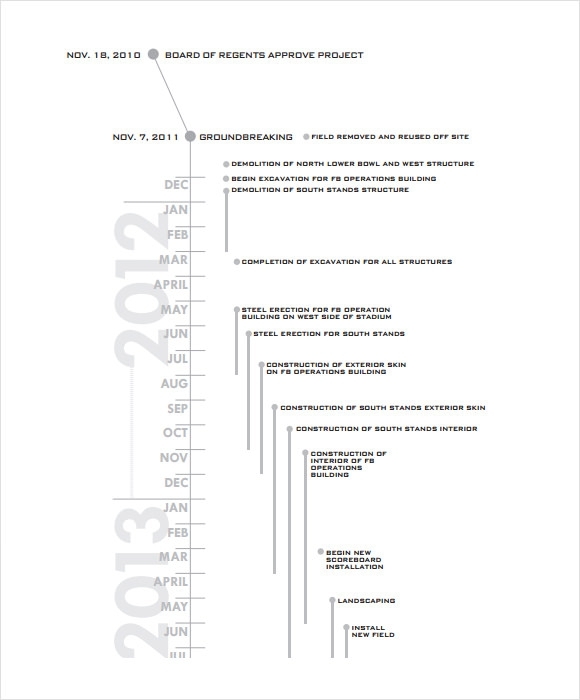 This sample construction timeline template depicts the entire construction timeline of a project from the date of approval of the project to the completion of construction. The design is based on flowcharts and is hence very catchy. 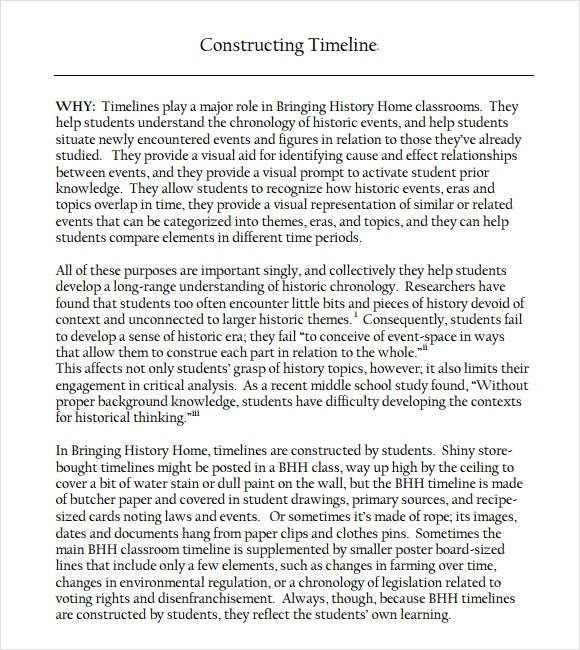 What is a Construction Timeline Template? A construction timeline is basically a schedule or a date based list of all the activities related to the particular construction project. It is a “to – do list” of sorts. The list includes the intended dates of starting and finishing the project. Apart from those, it also includes the dates for specific activities, such as phase completion, other milestones, material purchasing dates, labor payment dates, etc. A construction timeline template does exactly that. It serves as a calendar of sorts to remind people of the various deadlines associated with the construction project so that they can act accordingly. Apart from that, a construction timeline template also helps in planning the project thoroughly.You can also see Event Timeline Samples. 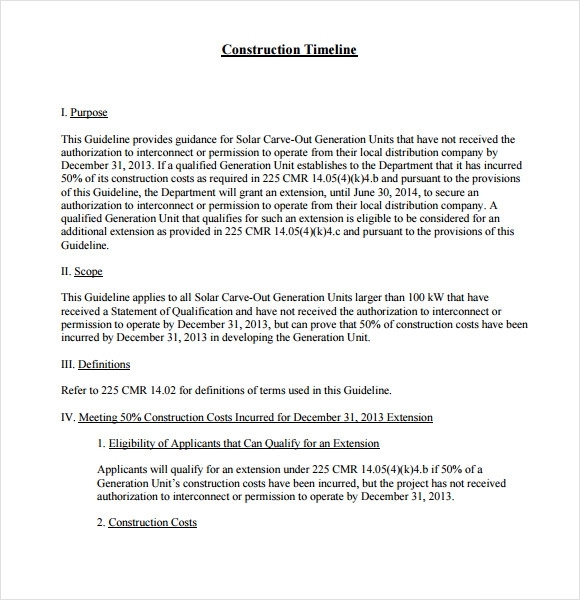 What Are The Benefits Of Construction Timeline Templates? A thorough construction timeline reduces the possibility of the arousal of unforeseen circumstances to an extent. Quality control measures can be properly implemented. 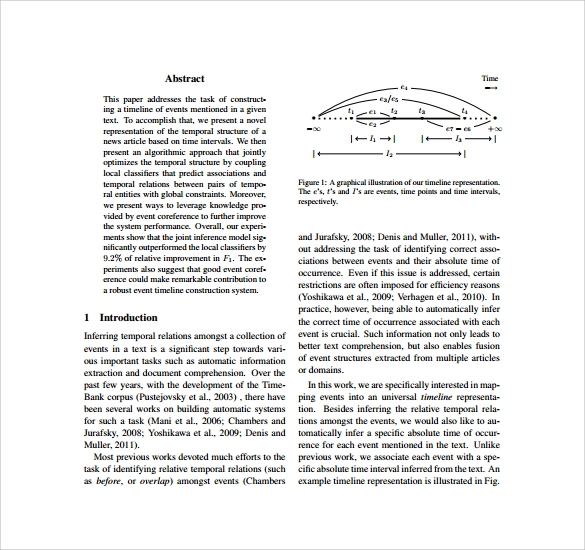 Resource allocation and arrangement (materials and labor) can be planned well in advance. Better coordination between the construction company and its client. Allowing appropriate time for relocation of aggrieved parties. Safety of work Making sure not to damage adjacent property. How To Prepare A Construction Timeline Template? Construction timeline template preparation is an extremely easy thing to do, but you must have thorough knowledge about the construction of the project. If you are thorough with the construction details, then just pen them down, in order, one after the other, providing dates for the processes at the same time and you shall have created your very own construction timeline. Make sure not to miss out on anything that could affect the construction as because there is very less margin for error. An example of can be yours by downloading it in the internet that any team leader can look into before or after a scheduled project is to be accomplished, sample format can be seen in this template. Anyone can make a construction timeline based on the time and supply given to them to achieve the project without delay or problem in the construction.You can also see Project Timeline Samples.